We got a totally awesome parcel though the post, I was actually rather excited to show the kids. On holiday both kids loved the hit song " I am a gummy bear". 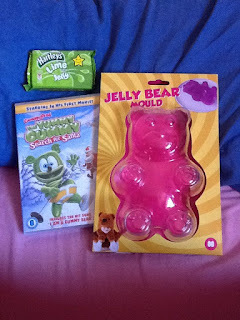 In our parcel it contained the new Gummy Bear - The Yummy Gummy Search For Santa DVD - Bear jelly mould and a pack of green jelly to make our own yummy gummy bear. In this festive thrill-ride Santa has gone missing and Gummy Bear is taking it upon himself to find him and to save the day for the children of the world. More or less ably supported by his friends Harry (a Chameleon), Kala (a blue cat) and Vam Piro (a vampire bat who faints at the sight of blood), Gummy Bear must venture into the North Pole to track down the missing Santa, taking on aliens and more troubles along the way. The film is great its been on everyday so far, Lexie loves the singing and dancing in there. There is also a selection with just the songs on. 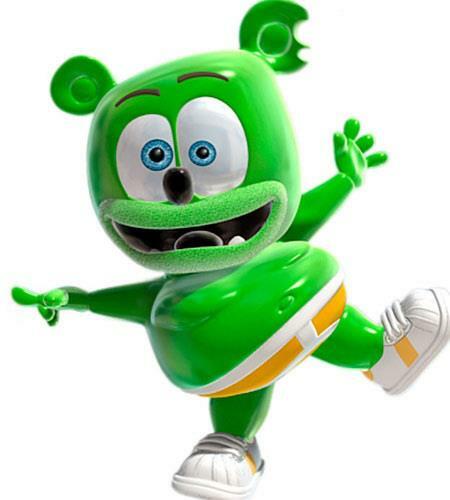 Was slightly disappointed that the original " I am a gummy bear" song isn't on there, it only plays for a few seconds in the film. So we have hit YouTube for the hit single. The film gets you laughing and it's hard not to love the little annoying bear, with his pants on that has a habit of wiggling his bum. We have a special giveaway to win your own DVD by filling in the form below. I would make a bike, it would be fun trying to get the wheels to go round ! I would make a table and chairs set, so when my 3 kids have finished their tea, they can tidy up by eating the furniture after! I'd make a jelly bed, now that would be a lot of fun! a jelly xmas tree ¬! I've always wanted to make a giant bouncy castle out of jelly! I would be a jelly snowflake - completely unique from every other jelly. A pillow for my bed, I can just imagine how comfortable that would be. chocolates - they are fat free and less calories!! A jelly bath so its comfy!! !